Feel free to leave your comments on your visit to Zoo Lights this past season. Share your memories with us! Comments at the bottom of this page. Did you have a chance to come to Zoo Lights this 2017/2018 season? We had a great time showing visitors our dazzling, custom light displays that lit up zoo trails during the dark, winter nights. The lights turn on each winter on the Friday after Thanksgiving Day, the so-called Black Friday. We run the lights Thursday through Sunday evenings throughout the winter up to early March (the last day for this season was March 4). 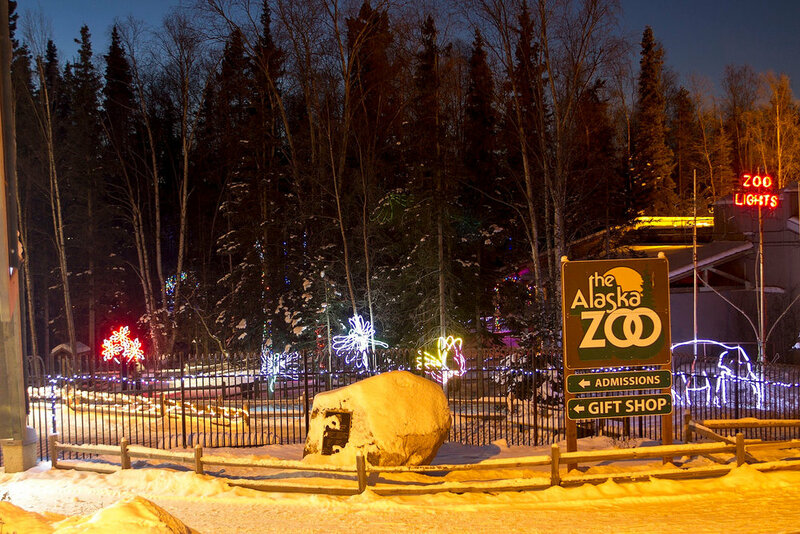 We even offer nightly Zoo Lights over winter break for families to enjoy while the kids are off of school. We would like to extend our gratitude and appreciate for our Zoo Lights sponsor, BP. Their annual support for Zoo Lights helps us to continue offering this incredible opportunity for all visitors. THANK YOU, BP! We wanted to post a gallery of images taken by John Gomes at Zoo Lights. We hope you enjoy the image and check back for the next round in Zoo Lights in November 2018!